Loraine and Steve Findlay accompanied three promising young players to an exciting bridge training camp. Here is their report. What a lovely adventure for Donald, John and Pranav at the camp. There were 30 juniors in attendance from Sweden mostly but ourselves from Scotland and one young girl from New York. Age range and experience from S1 upwards to early 20s with a wide variety of experience which involved some competitions being run in two parts. 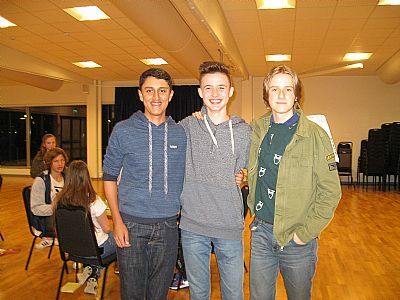 The juniors were in the excellent hands of Erika, Kiki and Daniel, three talented young bridge players all under 30 with lots of energy and enthusiasm and tremendous stamina. The juniors played more than 150 boards during the four days with the ethos of the camp being one of enjoyment and fun. This certainly proved to be true. Thursday night there was an individual competition followed by fun boards afterwards, our juniors did not wish to go to bed even after a long day of travel. Friday, they played in pairs and teams events which they also enjoyed enormously. Other bridge events included great fun events such as Speedy Gonzalez which was a pairs event of 6 rounds where you had to complete 4 boards in 20 minutes, then 16, then 12, then 8 and finally 4 minutes. It was amazing to watch the wee ones who were given longer times equally engaged at playing as fast as they could with one wee girl even calling the director as she noticed a revoke. My goodness she was jumping up and down for the director so she could continue play! I was amazed at how fast they played. Believe it or not our lads and their partners did finish the last round to achieve their bonus score. Lots of hilarity involved. They were also expected to take part in physical activities between bridge tournaments and were offered the chance to go horse riding (Swedish cantering style) with Donald on a horse for the first time. A lot of football got played both indoors in the wonderful arena of Vesterhavet with its adjoining very high quality accommodation and lovely restaurant. They also had a final game outside after the last evening of bridge. The juniors were also taken to a bowling alley with a coach laid on for this at 8 pm and more bridge after they got back. Sunday saw more fun tournaments and we were introduced to bridge bingo and Instruction bridge. 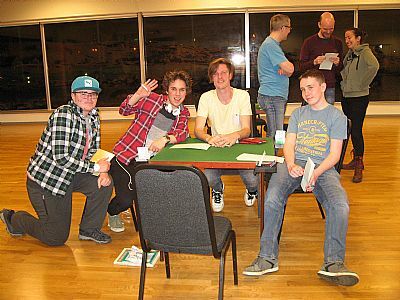 To explain – bridge bingo consisted of a card with twenty different contracts on it which had to be crossed off as the tournament progressed with your opponents trying hard not to let you make your contract at the same time. If you scored off five from your card you got 10 percent added to your score. Instruction bridge was also funny with instructions in wallets for dummy to play declarer’s cards instead or an opponent to tell declarer which cards to play from dummy amongst other instructions for individuals to stand up when they played a jack for example or give your right-hand opponent a compliment which would make them smile. Another instruction asked the players to revalue their cards with cards being given new values for point counts which they really had to get their brains round. Our wonderful hosts at Vesterhavet were Roger Wiklund and his father who subsidised the event wanting to give something back to develop junior bridge and I am grateful for their kindness and generosity. To sum up our wonderful four days, great fun, fitness both in mind and body and hopefully enduring friendships as the juniors really bonded and made friends. Yesterday in the airport they were engaged in playing on BBO with their friends who were returning by train to Stockholm. Altogether it was an amazing and unforgettable experience.